On this website you’ll find information about the Dutch artist Marinus Heijnes (1888-1963). Before the second world war the artist had received not only a lot of appreciation in his homeland The Netherlands, but also abroad. He travelled and painted in Switserland, Italy, Sweden, Belgium and France. On ‘exposities’ you can find information about where the artist exhibited his paintings, according to old newspapers from the 1930’s. 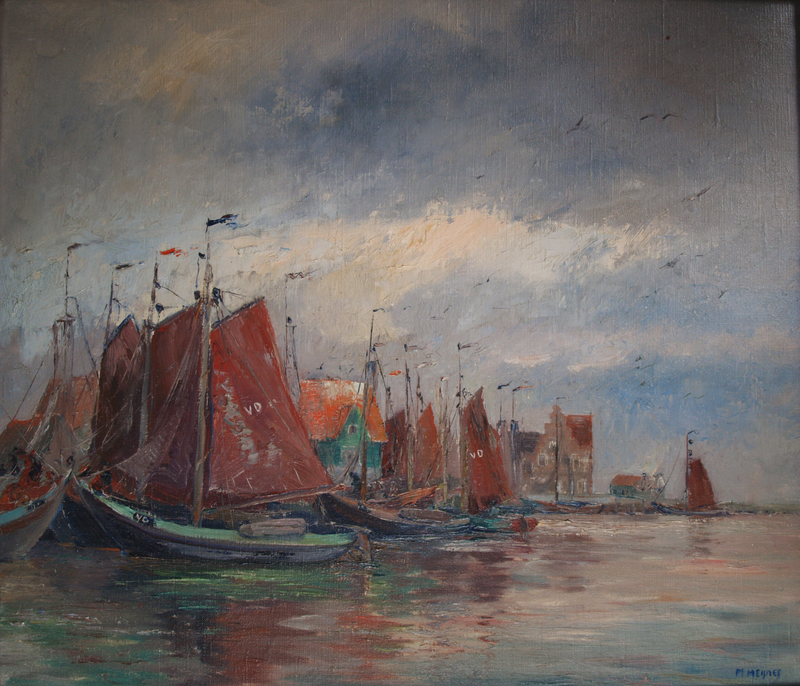 Marinus was born in 1888 in Amsterdam, close to the river IJ and the famous Amsterdam canals. He went to the Quellinusschool (later called Gerrit Rietveldcollege) and after that he travelled to Switzerland. He wanted to exhibit in St Moritz, but he didn’t like the fashionable life, so he travelled to the Italian lakes (Tessino) and Venice. He came from Italy and Switzerland back to the Netherlands (Brabant) in 1912 to work. Once back in Switzerland (Luzerno) Marinus planned to go to Jerusalem with a friend. On the day before he planned to leave to Jerusalem, he received a postcard with a picture of the Dutch dunes and the Northsea. He travelled back to Holland again to go to the dunes. With a little boat he sailed from Brabant to Katwijk, but because of the wind he got stranded in the small island ‘’De Kaag’’. There he met the schoolteacher Charlotte, with whom he married and had 4 children. The family Heijnes live from 1927-1929 in Noordwijk, near the Northsea, but they also travelled also several times to Riviera (Eze) and Brittany (Douarnenez). In this period he also maked some abstract works, in which he tried to visualise the sound of the birds such as the ‘’singing nightengale’’. After 15 years of being a painter, 1929 he decided to give exhibitions of his work in The Hague, Haarlem and Amsterdam. Where these exhibitions were is presented at expositie. In the years before the 2nd worldwarMarinus and his family again often travelled abroad. Douarnenez was a favourite place for Marinus to paint. 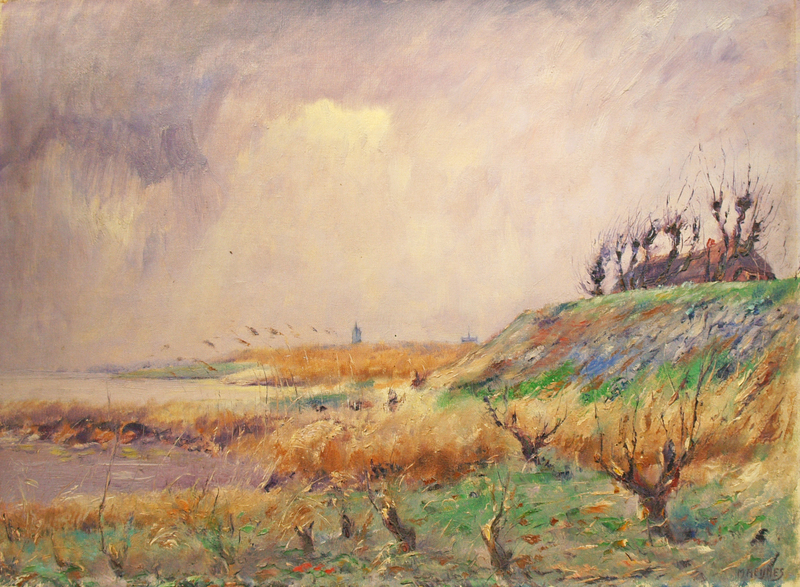 When Marinus was in his homeland Holland, he mostly painted the waterlands nearby De Kaag and the Brabant moors. Famous are his waterlilies and his sights of the sea. These paintings can be classified as the ‘’HaagseSchool’’. In the years before the war Marinus was a member of the famous Dutch artist clubs: ‘Kunst zij ons doel’ (KZOD) from Haarlem and he gives exhibitions together with famous contemporary painters like Gabriëlse, Cees van IJsseldijk, Jacob Ritsema, Lizzy Ansingh and J. Tiele. With KZOD (www.kzod.nl) Marinus exhibited several times in the famous Frans Halsmuseum te Haarlem. In 1940 he participated in an exhibition called “kunst van heden” in the Rijksmuseum in Amsterdam, in 1942 in the exhitition “volkskunst” in the Museum ‘ Boymans van Beuningen’ in Rotterdam. After the 2nd world war it seemed that the interest in Marinus’ art had decreased. The artistic taste of the audience had changed and new art concepts were getting more attention. Marinus tried to sell some work in the USA (New York), but only a few works were sold. MarinusHeijnes’ son Theo, also painter, left with his wife to go to Sweden, and Marinus made several trips to that country. In 1953 a journalist in Jonköping writes an article in the SmalandFolkblad. One of the famous buyers of one of his paintings was Countess Estelle of Crevignan, zweden. Marinus remained painter until his death in 1963. When Marinus died in his little house on De Kaag, his wife inherited a lot of paintings. The paintings were photographed later, in 1985. Therefore, we are able to show his paintings on this website.